ELFA Chinese Preschool adopts a Bilingual Curriculum approach with strong emphasis on Chinese language acquisition that is in line with guidelines provided by the Ministry of Education. Established in Singapore since year 2000, ELFA operates a network of more than 30 preschool centres in Singapore and China, providing quality care and educational services for children between the age of two months and six years old. 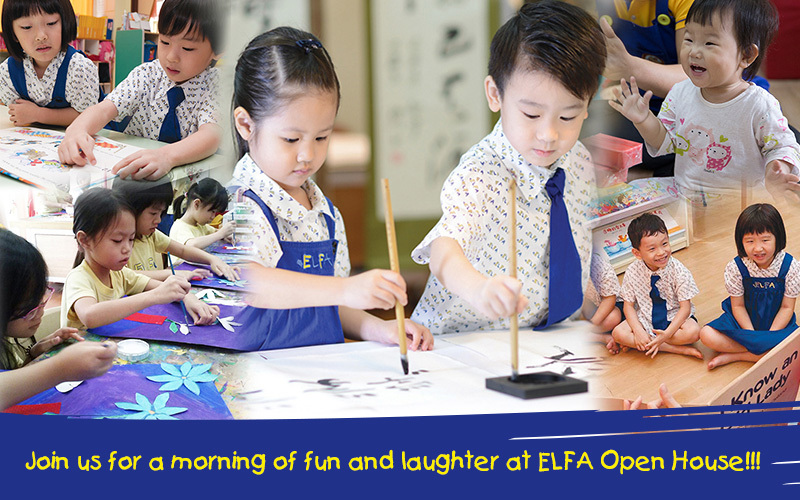 Come experience the ELFA curriculum at our Open House on 23 March from 9am to 1pm. The Open Houses are held at ELFA centres located at Pandan Valley, Serangoon and Tampines. We have planned a series of educationally fun and exciting activities to give you and your child a taste of our unique Chinese immersion programme! Pre-schoolers can participate in activities such as Calligraphy, Chinese Painting, Chinese Story-telling and Music and Movement during the open house. Go on a personalised centre tour to check out our facilities while you’re there! *SPECIAL PROMOTION available exclusively for New Enrolment only. Talk to each centre to find out more! Terms and Conditions Apply. Thank you for your interest in ELFA Chinese Preschool. Please submit the registration form to confirm your spot at the open house as we have limited space. See you and your family on the 23 March!